Published to co-incide with the release of the documentary A Montage of Heck in the Spring. More than 20 years has passed since Kurt Cobain killed himself and his legacy still continues to fascinate and inspire people. This riveting chronicle, which accompanies award-winning director Brett Morgen's highly anticipated documentary, paints and illuminating and honest portrait of the Nirvana frontman, capturing the contradictions that made up his character. Includes full transcripts of hundreds of hours of interviews with Cobain's family members and friends, many of whom have never spoken in public before. Includes interviews with Courtney Love and Wendy O' Connor (Kurt's mother). These interviews seen in full for the first time in this book, paint a remarkable and sometimes shocking portrait of Kurt. The book will include stunning animation by award-winning animator Hisko Hulsing, some of which appears exclusively in this book. 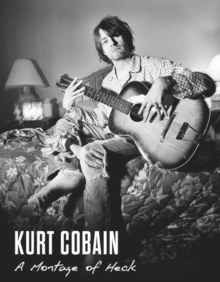 Features never before seen photographs, journal pages and other artifacts, offering revealing new insights into the life and character of Kurt Cobain.